Well, over a week ago, one of the users of this site invited me to join, so here I am. Hello, I am redlerred7, a hobbyist writer and artist. I will be lurking, mostly, but will occasionally participate in discussions when I feel like I have something to say. I hope we can all have a good time. Here I am; welcome on board. I'm glad people are excited for my writing. Recently, however, I started a crossover fic between Madoka and RWBY. The artwork I'm working on, my current avatar here on this forum for example, is part of it. If anyone is willing to beta for me, I have approximately 20k words drafted. I still need to give it a name. 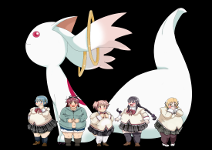 If you're okay with fanfiction that's not Madoka, my Fanfiction and Archive of Our Own username is the same as it is on this forum. You can check my work there if you wish.